This year the town of Medina got new Christmas lights throughout town and we had a special time as the whole town got together to sing Christmas carols and bring in the Christmas season with the lighting of the Christmas tree. During Christmas you see lights and it’s a beautiful analogy of the Jesus… the Light of the World… coming to us. The idea is that that the times were so DARK that rather than trying to walk through the darkness and risk stumbling, people just gave up trying to walk through it at all. They just stopped and sat down. It was a picture of hopelessness. At that particular time the world sat in darkness politically. Rome ruled the world and merciless and brutal. The world was also in darkness economically as Rome taxed everyone excessively. … But I think the worst type of darkness was the spiritual darkness. In between the Old Testament and the New Testament there was a 400 year period in which God was silent and there was no prophet in the land. 400 years! It was dark… and then BAM – there was LIGHT! The Bible says that “The LIGHT has come into the world, but that men loved darkness rather than light, because their deeds were evil” (John 3:19). It’s still the same today. People will put up Christmas lights and even sing Christmas carols. They love the baby Jesus, but they don’t want anything to do the adult Jesus who came to lead people out of darkness and into the light. 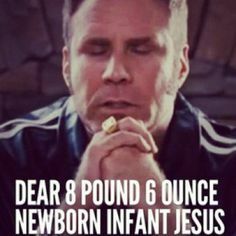 In the comedy, “Talladega Nights,” Ricky Bobby played by Will Ferrell is this goofy mixed up NASCAR Drive and when he leads the family in grace at the dinner table he prays to Baby Jesus, “Dear Lord Baby Jesus, lying there in your…your little ghost manger, lookin’ at your Baby Einstein developmental…videos, learnin’ ’bout shapes and colors…” and when his father-in-law reminds him that Jesus grew up to be a man… Ricky Bobby’s answer was, “I prefer the Baby Jesus,” which is what a lot of people today do. Some of you might feel like you’re sitting in darkness. This Christmas I want to challenge you to step out of the shadows into the light of who Jesus is and walk in the light as He is in the light. (1 John 1:7). Allow Him to set your hearts on fire. … and after catching fire for Him, my prayer is that you will let His light shine before you like never before this Christmas.